People have been collecting rainwater for the purpose of drinking it since time began, but this might be the first time that a raincoat has been used as an on-the-go collection device. 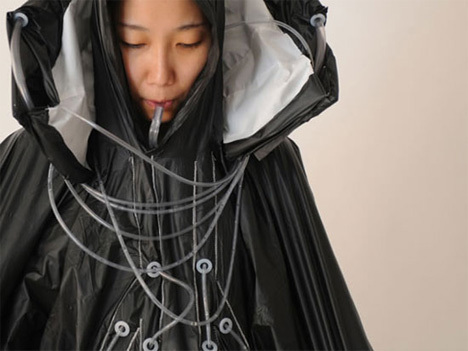 The Raincatch rain coat was designed by Hyeona Yang and Joshua Noble to provide clean drinking water to people without enough sense to come in from the rain. The coat features a series of straws and attached filters along with some pockets for storing collected water. We aren’t sure if the designers have ever actually tried to collect rainwater, but unless there’s an absolute downpour happening the average person standing in the rain won’t collect a whole lot of water. Still, this is a novel design that makes good use of a natural resource.